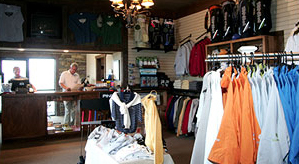 The Golf Shop at Territory Golf Club offers an excellent selection of quality golf equipment, apparel and accessories. Territory Golf Club offers a great selection of items from brands such as FootJoy, Nike, Page & Tuttle, Izod, AHEAD, Monterey, Blackwater Bay, Titleist, Taylormade and More! Popular gloves from Titleist and Foot Joy and all the latest balls from Titleist are always available. Territory Golf Club carries a selection of the latest wedges, putters, and metal woods which are available for demo use.